Jack Bell Gallery is pleased to present Lavar Munroe’s third solo exhibition at the gallery. Munroe will debut a new body of mixed media paintings and sculpture that utilises wall and ground to explore impermanence, memory and the concept of heroics. Gun dogs, according to the dictionary, are types of hunting dogs developed to assist hunters in finding and retrieving game. The term ‘gun dog’ is also synonymous with attack dog. An attack dog is defined as any dog trained by a human to defend or attack a territory, property or persons either on command, on sight or by inferred provocation. Throughout history dogs have been used for various reasons ranging from farm work, to slave hunting, to law enforcement and personal protection. The black mind and body have endured extreme trauma in relation to these animals. During slavery the dog was used to hunt, detain, and sometimes kill slaves. Today, law enforcement use dogs to hunt, interrogate, injure and kill criminals and sometimes civilians. Gun Dogs also served as the name of a prominent street gang in the Bain and Grants Town area (Nassau, Bahamas) in the late 80s early 90s. Prominent for petty theft, robberies, and the infamous bark, the gang members used the dog to symbolize their specific set of images and mentality. The dog served as metaphor for man and communicated dominance, animalistic behavioral traits within man, and otherness. It also identified the menaces and outcasts from society who thrived on the notion of ‘survival by all means’. Dog’s Bark Break The Night depicts the head of a hybrid species of dog devouring a vine like form. Teeth embedded in the animal’s bloody gums evoke a vicious confrontational beast in the process of attacking a being. The viewer becomes witness to an act in progress, and simultaneously plays the roles of witness and victim. And The Dogs Went Silent draws on the notion of the gang/pack mentality. 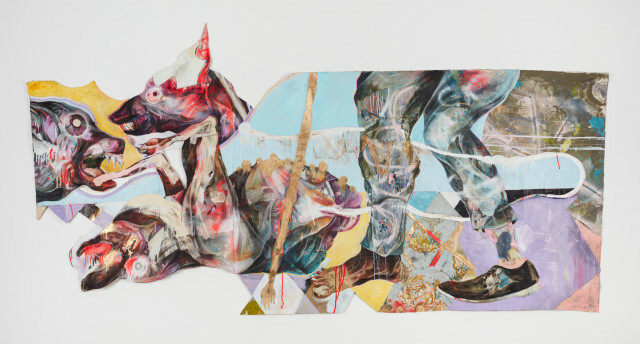 This work serves as metaphor for the hunt and points to both survival and predatory instincts within animals and man. We see a human silhouette confronted by five aggressive dogs, drawing on ideas surrounding victimization and fear. Munroe’s intentions in this exhibition are to spark dialogues related to notions of ‘animal as totem’ - in this case, the dog - and to question the term ‘To Protect and Serve’ as it relates to those deemed in authority. Specifically, at what point does enforcement become a hunting exercise and to what extent are animals, and their owners, trained to associate a specific demographic as perpetrators? Lavar Munroe b.1982, Nassau Bahamas, works between Germantown MD and Nassau Bahamas. His work will be included in the upcoming ‘Prospect 4’ triennial in New Orleans, directed by Trevor Schoonmaker. In 2015, Munroe exhibited in ‘All the World’s Futures’ at 56th Venice Biennale, curated by Okwui Enwezor. In 2016 he participated in the 12th Dakar biennale, curated by Simon Njami. His work has been shown in institutions such as the Mildred Lane Kemper Art Museum, Orlando Museum of Art, National Art Gallery of the Bahamas, Nasher Museum of Art, Contemporary Art Museum of Raleigh and SCAD Museum of Art among others.